Joseph Dwyer is one of America’s heroes. 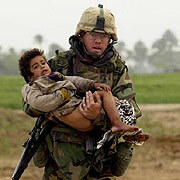 This photo is one the propelled him to national recognition in 2003, rescuing a young Iraqi boy during a firefight. Joseph died this week from an apparent overdose. He was never able to move beyond his war experiences, the horrors he witnessed. Eternal rest grant unto him, O Lord, and may perpetual Light shine upon him. Amen. Oh my gosh, that is just so sad, my prayers are with his family. Second that thought. Sad, sad, sad!